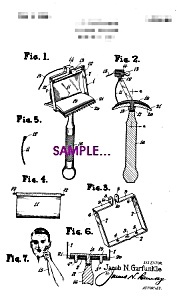 Early Artwork for a 1920s Patent Document [Matted For Framing] for a Lighted Razor (barber shop) for by Mr. Garfunkle. This piece is 5x7. We have many other interesting pieces of Barber Shop and Shaving Memorabilia on our website.